Many insects dependent on dead wood are considered threatened by modern forestry. This may partly be due to substrate patches being too widely scattered to be effectively colonized. We studied how rates of colonization by insect species breeding in polypore fruiting bodies are affected by interpatch distance and habitat matrix characteristics. In field experiments, fruiting bodies of Fomitopsis pinicola and Fomes fomentarius were put out at different distances from natural sources of insects. The anobiid beetles Dorcatoma spp. were the most successful colonizers of distant patches, and they readily flew over open fields. Cis beetles were less successful colonizers, despite their generally higher abundance. We hypothesize that the Dorcatoma spp. are inferior competitors, but superior colonizers of distant resources compared with Cis spp. 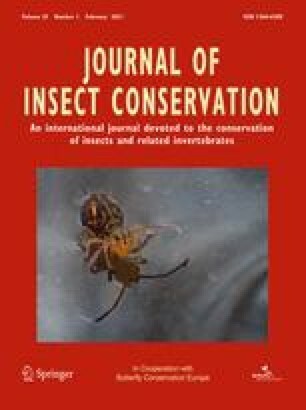 The flies Leucophenga quinquemaculata (Drosophilidae) and Medetera impigra (Dolichopodidae) appeared to be more affected by distance than the beetles studied in their colonization of fungal fruiting bodies. Lower rates of parasitism were recorded on distant patches, and parasitoids appeared more affected by distance than their hosts. Most of the insect species studied can probably persist in the managed forest landscape if suitable breeding substrate is created continuously on a 1 km2 scale.